When people think Hurricane Katrina, first thoughts turn to New Orleans. But as Mississippi Forgotten shows, the effects of what happened on the entire Gulf Coast was quite remarkable. 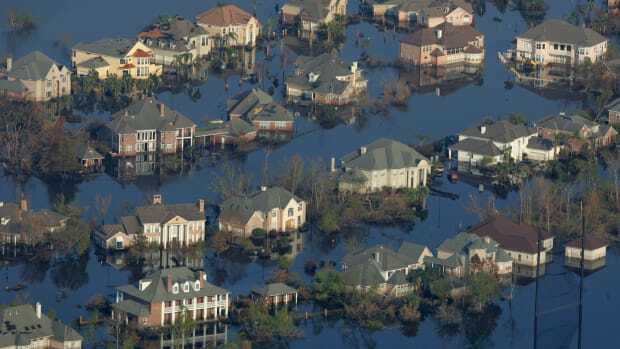 In the wake of Katrina in August 2005, the world watched as New Orleans filled with water and hundreds of thousands of evacuees tried to find water, shelter and food. The media focused its coverage to New Orleans but relatively little was said about the Mississippi Gulf Coast until the next day. Katrina destroyed over 90,000 square miles, an area roughly the size of Great Britain. The epicenter and devastating northeast quadrant of the hurricane made landfall east of New Orleans in Waveland, Miss. The documentary Mississippi Forgotten (watch it below, length: 15 min.) gives Katrina survivors on the Mississippi Gulf Coast a chance to speak out about their situation. The film was made in November 2005 by Timothy Burdick,Erika Logie and Brenda Manookin, three Brooks Institute students in California who set out to spend Thanksgiving with displaced families. The documentary reminds us of the physical scale of the disaster and the ongoing effects it had on the storm&apos;s victims. Many still lack housing two-and-a-half years later with Congress seeking answers from the nation&apos;s top housing official. The crisis may have played a factor over Iraq or the economy in the Mississippi Democratic Party primary results. Sen. Barack Obama, who said he stepped "into the breach" in the early days after Katrina, won 60 percent of the vote in the March 11 presidential voting contest. Meanwhile in New Orleans, ideas are plentiful but big business has yet to invest in the recovery, Jed Horne, city editor at the Times-Picayune when Katrina struck, writes in the debut issue of Miller-McCune magazine.